Is it snowing in Abetone ?Merci! Abetone is the major Apennine resort. It is located in a state forest on the Modena to San Marcello Road, near the border between Tuscany and Emilia Romagna, The ski access points are at Faidello (1220m) Abetone (1400m) Le Regine (1200m) Plan di Novello (1150m) and Cutigliano (733m). The area has 54 lifts over a wide area with 27 at Abetone itself, including many chairs. These access an extensive network of mixed-ability pistes above and below the tree-line. The highest point (Monte Gomito) is 1940m. 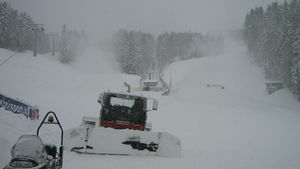 20 kilometers of the ski slopes have snow-making facilities. There are 2 ski schools. This year, I think like everyone everywhere with a ski holiday planned, we are anxiously watching the snow reports. But this will be our third season. As all the reviewers say, it just works! Our girls progressed in their skiing, partly because it's not too big or daunting, so they can look to go everywhere. It also means for the more capable skiers/ boarders you can relax a bit; you don't have the pressure to do 'all the slopes' to cover the cost of a high ski pass. Over on Val de Luce the runs are longer and wider (dare I say, laid out more recently) than the ones out of Acetone, but all quite easily connected. The restaurants are well priced on and off the slopes. We have stayed at the Bosscolungo previously; good value for money with family rooms and a large pool that kept the children off iPads. From the first trip of two families, we became four and this year, six. We have moved to Val di Luce hotel in Val di Luce and it's first class; based on one meal last year and a look at the family suites. Also with gin and tonic being made that way round! The best steak and enjoyable dinner is at the restaurant at the Hotel Regina and the best pizza restaurant is on the left hand side as you drive through Abetone, away from the Albergo la Primula (opposite Boscolungo). It is where the most enjoyable 'one after the slopes' became a few more because the owners were so hospitable; the time flew. We were with our friends and the owners just made it so comfortable. Can't praise the place enough.